What are Azerbaijani style pancakes? I had never heard of them! But as I’m always trying to find special weekend breakfasts, I was really curious. What a nice surprise it turned out to be, the saffron gave the sweet syrup a unique flavour and the cardamom in the batter the Middle Eastern feel I love so much. The pistachios were supposed to be ground but as I love a certain crunchiness, I just chopped them coarsely instead. The pancakes are meant to be cooked quite small and at the same time. I chose to do fewer and bigger pancakes, one at a time. 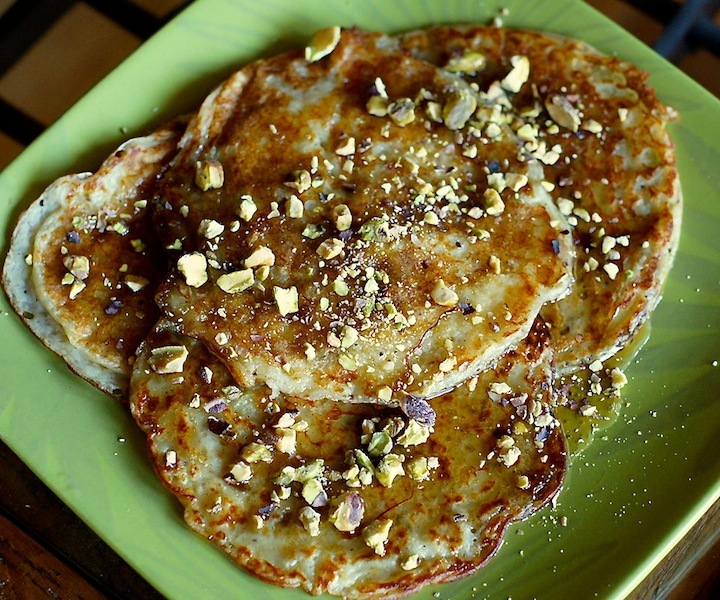 The author I adapted the recipe from, Najmieh Batmanglij, also suggests you could do one traditional big pancake instead. I decided to pair this great dish with a healthy kale banana berries smoothie adapted from a recipe by Mexican Chef Oropeza. 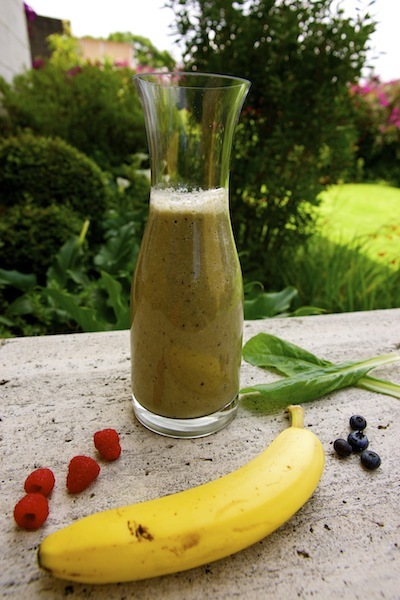 I think the sweet flavour of the fruits contrasts well with the slightly bitter and nutty taste of the kale, the almond milk and the healthy chia seeds. The cinnamon gives the smoothie a nice sweet spicy flavour that I thought worked well with the Azerbaijani pancakes. In a big bowl beat together the egg, yogurt, baking soda and cardamom. Gradually add the flour and whisk until thick and well mixed but don’t over mix. Let it rest for 5 minutes. To make the syrup: In a saucepan bring to a boil the sugar, water and saffron-rose water. Reduce to low heat and let it simmer for 5 minutes. Set aside. Heat a pancake or small pan lined with cooking spray in medium low heat. Pour one small ladle of the batter into the pan and cook it for 4 minutes. Flip it over and cook until golden. Repeat for the rest of the batter. 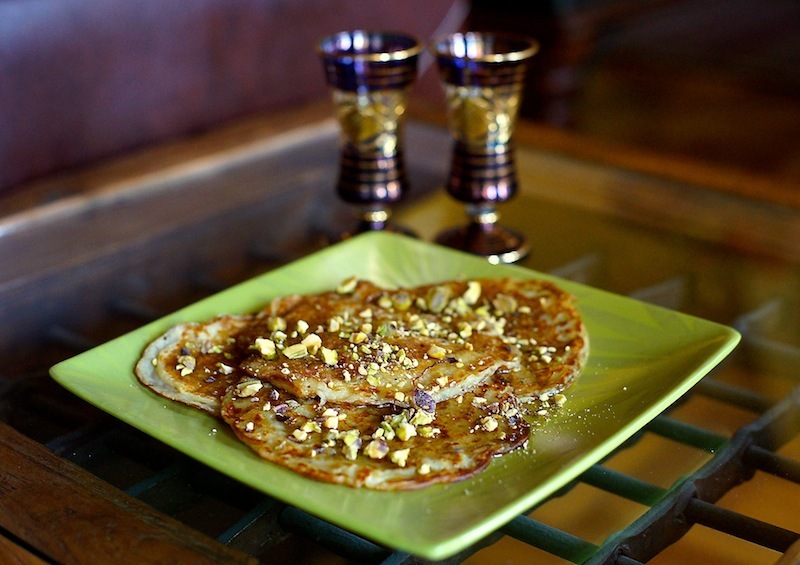 Place the pancakes in a serving dish, drizzle some syrup over them and sprinkle with the pistachios (and rose petals). In an electric blender, blend all the ingredients together until creamy and smooth. Enjoy!